Southern Heritage Homes does a great job of building a house in their factory. They do a relatively poor job of delivering and setting up a home in its final location in bad weather. of the threat that still exists to the interior of our house. Gretchen and I have both had many years of project management experience, so we tend to expect that things will go wrong in any project. As a result, we tend to ask the hard questions while a project is in its early stages. One of the first questions we asked was, "What precautions do you take to insure that modules does not get damaged during delivery?" We were assured that modules were totally wrapped and weatherproofed for transport. A prospective customer we had recommended was given the same assurance. It turned out that this was a falsehood. Modules were shipped with no rain protection on the front face. Windows were open on one module and the windows on the leading ends of the four modules were unprotected. The modules took on water during the trip to the site and during temporary storage at a nearby dairy. This was November 25. The Southern Heritage staff had been responsive and attentive when the modules were under construction, so we were taken aback when we first reported that the modules were unprotected and got a lot of foot shuffling and denial. Our factory sales contact said, "That shouldn’t have happened!" but hemmed and hawed when I asked if something was going to be done about it. Jason, the installation manager finally got on the phone and told me that it shouldn’t present a problem because the units were "sealed" on top. The modules were only fifteen miles from the factory and I would have expected that a truck with plastic and batten boards would have been dispatched to make sure the units were secure. Nobody came, and the units sat for six days in the rain before they were installed on the foundation. I first saw the installed modules on December 3, after the roof was on, and observed that the floors of three modules showed signs of water damage. I called the factory again and got reassuring words, but no answers, and no offer to visit and inspect. The next day, I saw that the water damage was spreading. I called the factory and got a response that the siding people would be there soon and this would handle the problem. I pointed out to them that the roof had been on for several days and the water was still coming and the walls were wet in spots. At this point Jason admitted that the roof had been installed while there was a thick coating of ice on the roof. They were trying to get the roof up in a hurry and didn’t remove the ice built up on the module roofs. Haven’t these people ever heard of black mold? It is now 14 days since we first reported that the modules were unprotected against weather and water. The roof is on the house and water continues to seep down the inside walls and across the OSB floor. OSB delaminates when wet. Drywall expands and crumbles when wet. 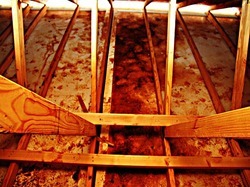 The walls of three modules are wet and a water stain has appeared on the ceiling of the great room. I climbed up there yesterday to see what was going on and took these photos. Jason, the installation manager, said he was going to inspect the module roofs a week ago. I guess he didn’t look in the right places. On Monday, I am going to demand that Southern Heritage gets a large space heater up there and runs it until the entire attic crawlspace is bone dry. I am also going to demand that they get space heaters in every room with water damage and run them for days until the walls are bone dry. After that, we will meet with Southern Heritage and review what options exist for repairing the damage. We are going to recommend that they upgrade their module weatherproofing, delivery security, and installation procedures to bring their clumsy field processes in line with their factory processes. We will be blogging the results, so you might want to check back with us later. We hope they may be more responsive, now that they have unnecessary damage, and lost customer confidence to repair. We expect that they will institute changes so this does not happen to another customer. Foot shuffling and lame excuses is a fast way to throw away all the hard work that goes in to attracting a customer and building a fine home for him. It makes the customer so wary that they will probably warn other prospects about this possibility. If bloggers warn other prospects, the warning is permanent. The bottom line is: If a customer points out a flaw in your product or installation, FIX IT, then figure out how to avoid it in the future. Your customer will respect you, because we all make mistakes. The only fatal blow to your credibility is to defend the mistake or claim that it really doesn’t matter. Anyone else have the experience of a fine product degraded by poor installation and fumbling customer support? UPDATE: Things are definitely looking up. It is at 8:30 am Monday morning and Jason just called me . 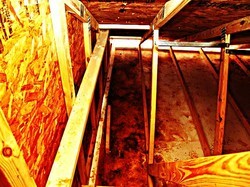 He will have a crew at the site this morning with heaters to dry out the attic crawlspace. They will also remove any ice on the roof itself so that shingles can be installed tomorrow. The crew will frame in the front porch roof today so the house will be completely shingled and dried out by tomorrow if all goes well. Jason promised to stay in touch with me and let me know how things are going from here on out. I will let you know of any future developments, but this is an encouraging sign. This entry was posted in Basic Business Concepts, Moving to Floyd, Possibly Helpful Advice. Bookmark the permalink. This is JUST like the “normal” construction industry. 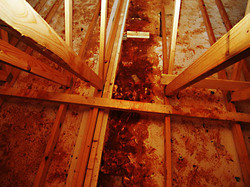 When our house was built, the roof was still open in some areas, drywall was up and it started to rain. A $10 tarp and little initiative on the part of the builder would have prevented damage the the partially finished interior. Instead we ended up doing the dance you are doing now. David: As you have noted many times before (and we discussed this past week), good customer service is a rare thing indeed. There is no excuse for what has happened here and it turns what could be the adventure of moving into a new home into a nightmare that will no doubt come back to haunt you. Keep the pressure on until the make it right. BTW, the ice here is worse than when you left on Friday. You may want to factor that into your travel plans. When I was managing food and beverage for Marriott a guest complaint was and probably still is considered an opportunity. It indicates a specific problem which can and should be corrected. We always thanked people for their “input”. Been following your move Gods country. Brings back so many happy (?) memories of our move to Groundhog Mountain just over five months ago.